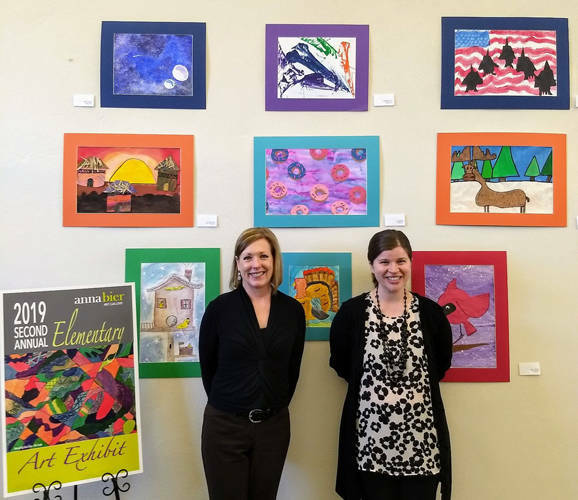 The Greenville Public Library is hosting the second annual K-6 Elementary Art Exhibit, which first hung in the Anna Bier Gallery. GREENVILLE – The Greenville Public Library is hosting the second annual K-6 Elementary Art Exhibit in the second floor Reference Room. This exhibit first hung in the Anna Bier Gallery and will be in the library the month of April in case community members missed it. An additional six pieces are displayed in the cabinet on the landing between floors. Art teachers from Darke County public schools, DeColores Montessori, St. Mary’s School and the local home school community were invited to creatively challenge their students with varying art projects during the past few months. Each teacher then was asked to select and submit the best works from their students to be juried in the Anna Bier Gallery Elementary Exhibit. Certificates and cash prizes were awarded. Librarians Deb Cameron and Candace Henne have partnered with Tamera McNulty of the Anna Bier Gallery to host this and future exhibits.